A photograph of 2005 by Célio Braga shows a close-up of human skin. It is the skin of a man, I presume, because it is abundantly hairy. The hairs are, however, red as if blood runs through them; they look like capillaries. 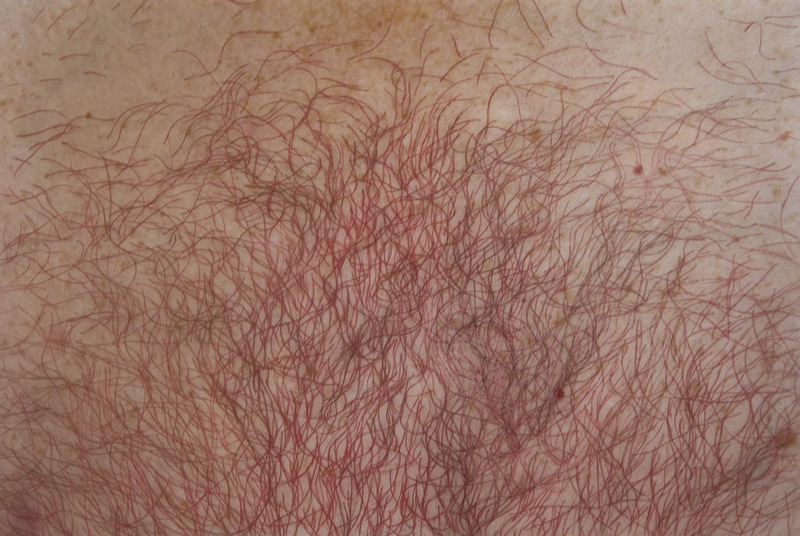 The sight of these blood-red hairs on human skin is uncanny; it confuses the reassuring categories of common, everyday life. Confusing categories, the body’s inside shows itself on the outsider. I cannot believe my eyes, literally. My eyes don’t master what they see. Instead, my skin responds: it shivers and the hairs on my skin stand up. My skin responds sensorially, as if the skin in the photograph were my own skin. Thus, two boundaries have been transgressed in and by this image, that of the physical country of the body, and, performatively, between two individuals. I take this photograph to be emblematic for Braga’s work, and this, in many respects. Skin, I will argue, is the central idea that connects his works in the different media in which he operates. Only in some cases, as in the photograph I have just described, does he represent real skin. More often, he deals with the medium or material he uses (the sheet of paper on which one draws or paints, a photograph) as a kind of skin. They are not ‘grounds’ or ‘screens’ on which the image will be formed. He deals with these surfaces as skins to the extent that they embody a boundary upon which the artist acts. The sheet of paper is not only a surface, it has two sides, and it can be approached, touched, worked upon from both sides. The sheet as boundary surface is cut, perforated and sewn. Of course, this view of a psychoanalyst cannot be unproblematically brought to bear on works of art. But to the extent that it represents a philosophical conception as well, it can be brought into dialogue with art. I contend that Braga’s work engages a dialogue with this rich conception of skin. 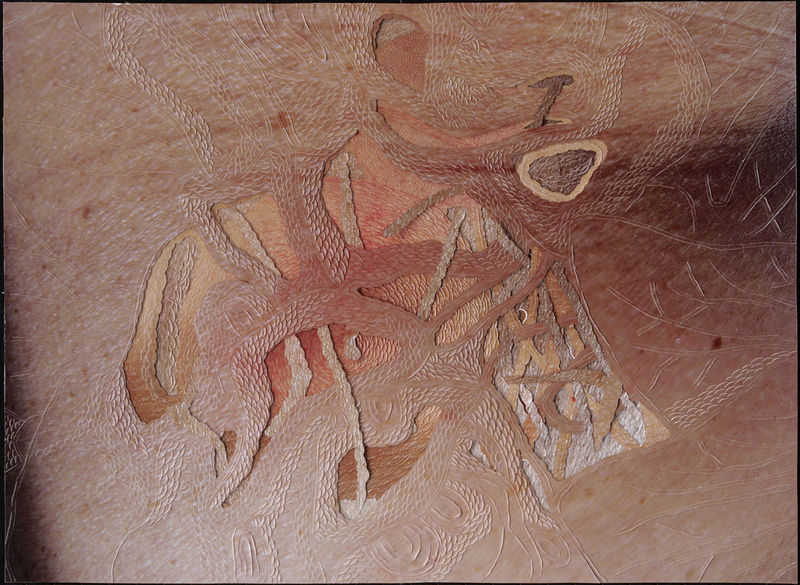 The artist’s work ‘on the skin’ seems to challenge the skin’s functions of containment and protection. His detail of a male skin suggests that some of the objects of containment, notably the blood on which life depends and which can be cold or hot, are no longer contained by the skin; the ‘capillaries’ lay bare and have entered the outside word. The identity between hairs on the outside and capillaries on the inside constitutes a visual pun that raises numerous issues of life, touch, and sensation. As consequence of this pun, he also challenges the common notion of the skin’s metaphorical meaning of ego. His works utterly lack the wholeness such a meaning implies. Thus, while endorsing, or absorbing Anzieu’s extension of the skin into the environment, he declines the totalizing wholeness that retreats back into the skin as boundary of the human individual. Instead, in his work, skin is presented as highly permeable. It opens out to the world. It does not mark a boundary, rather it is a zone of contact where spaces and beings are entangled, dissolved, and consequently lose themselves. In Anzieu’s terms this can be understood as ‘the common skin fantasy.’ Anzieu characterizes this fantasy of human relationships as problematic, because it is not taking place between autonomous individuals but as mutual symbiotic dependency. Braga, however, enacts the common skin fantasy as attractive and seductive, rather then problematic. In the following discussion of some of his other works I will describe what the attractions are of this fantasy of ‘a skin we share’ and which sense this fantasy is a form of idealization. …light, though impalpable, is here a carnal medium, a skin I share with anyone who has been photographed. The tone of this passage alone informs a strong sense of affect, in turn sustained by the bodily quality of the imagery. The verb ‘sharing’ smacks of an idealized interpretation of the touch between bodies this description of photography takes as its founding metaphor. And, although Barthes’ essay has at its center the melancholy surrounding an invisible photograph of the author’s deceased mother as a little girl, the essay as a whole emanates idealization. As I will argue, Braga’s vision of this shared skin is also bound up with mortality, although not to the death of a mother. Yet, his take on the permeability of skin is both more cheerful and more mournful than Barthes’, and both more positive and more tentative than Anzieu’s. Alleging Anzieu’s view for a first characterization of Braga’s work should not be misconstrued as an attempt to read his work psychoanalytically. Instead, I have alleged Anzieu’s psychoanalytic perspective on the skin only for a general characterization of this work, which neither conforms nor is entirely distinct from that view. Instead of pursuing a psychological understanding of his work, I seek to asses the artistic implications of ‘common skin.’ Anzieu’s view helps me to grasp the nature of that image, not its meanings. The psychological resonances are, however, all the time present. What is at issue in the fantasy of common skin is the question of boundary. Although the skin is not mentioned here, in the context of Acconci’s work of the time it is never far. The aspect of mourning is frequently associated with photographs, and through Barthes’ essay, the glossy surface that bears the imprint of the skin of the departed loved one makes the association compelling. If, for Anzieu, the fantasy of the common skin is the end, negative because it is psychically unhealthy, the reasons is that subjective existence requires both boundedness and boundary. Braga will take issue with both these aspects of ‘psychic health’ and bring their questioning to bear health issues of a very different kind. But Braga makes art, not philosophy or psychoanalysis. As it happens, the idea of boundary is also central in the modernist notion of the art work. And here, it is profoundly challenged as a precondition of subjective wholeness. As Rosalind Krauss and Yve-Alain Bois explain in their book on the formless, the modernist ontology requires an artwork to have beginning and an end, and holds that all apparent disorder is necessarily reabsorbed in the very fact of being bounded. The threat of disorder can have many causes, but a major cause is the materiality of the modernist artwork. Within the modernist conception matter does not exist except as ‘informed’, made over into form. And this ‘informed matter’ of visual art addresses itself uniquely to the sense of sight. It is especially in the modernism’s counter tradition of ‘the formless’ that the condition of being bounded is radically challenged. And formlessness is what is usually called ‘entropy.’ The term stems from physics and refers to a negative moment; it presupposes an initial order and a deterioration of that order. Bois defines it as the ‘constant and irreversible degradation of energy in every system, a degradation that leads to a continually increasing state of disorder and of nondifferentiation within matter’. Applied to art practices, entropy operates in various ways: by redundancy, by accumulation or infinite profusion, by inversion, by tearing, by wear and tear, by the invasion of noise into the message. Whatever act is performed in order to realize the condition of entropy, it breaks open the idealized view of the modernist art work as being bounded. Thus, it foregrounds the materiality of the used matter and/or the facts performed on this matter. This results in artworks that emphasize neither the ‘form’ nor the ‘content’, but the operations that displace both of these terms. Clearly, if Braga’s work can be related to art-historical precedent for an understanding of its innovative aesthetic, this would be the direction in which to look. The modernist transcendence of matter into form and/or meaning can not easily be realized in the medium of painting. Paint as matter is usually invisible. Braga, however, works in several media but not in painting. Whatever material he uses, he uses it in such a way that the result is emphatically ‘handmade.’ Detailed, meticulous labor is an ostensible feature of his work, its aspect as work. This quality of ‘handmade’ genders his work. This is most radically the case with his series of objects called ‘Rubros.’ The first series in this project, made in 2002, consist of ruby-red small objects, about the size of a human hand closed into a fist, from felt and silk embroidered with red glass beads, with hairs bursting out. A second series from 2004, titled ‘Brancos’ consist of white forms on the same scale. They look like organs from the body or even more sinister, like tumors. It is this second connotation that ‘unbounds’ these objects: these forms proliferate, they expand. The organic shapes suggest that they cannot be mastered or bounded. But the bounding is also countered by the fact that the time-consuming work and infinite patience that the making of these objects requires is so emphatically readable in the objects, thanks to the small scale and the fullness of the surface. We do not see shaped objects and their possible meanings but first of all the endless work that went into the production of these objects. It is this sense of the tedium of labor that defines them as ‘woman’s work.’ Within the traditional hierarchies of Western art, this association both to labor and to women doubly degrades these objects as aesthetic objects; it gives rise to an aesthetic of the low. This low aesthetic is compounded by the visual motives, or ‘contents’ of the forms. The suggestion of organs or tumors only intensifies this degradation. This ‘aesthetic of the low’ should, however, not be misunderstood as being of secondary importance; low here is not subordinate to high. On the contrary, the lowness of woman’s work and of materials seen as female (textile, beads) is consciously and provocatively, even in a specific sense, ambitiously pursued. It isonly through this lowness that the idealism and transcendental quality of the modernist art work can be countered. The aesthetic of the low is in Braga’s work the highest, the most attractive, and the most powerfully seductive aesthetic. Ultimately, these objects are jewels; not jewels for decorating the body, but jewels which form such an object of fascination and attraction that subjects come under the spell of them. This enchantment threatens the autonomy of the powerful Western subject as individual. Literature offers an antecedent for this aesthetic deployment of jewelry. ‘Des Esseintes’, the protagonist of Huysman’ novel ‘A Rebours’ is perhaps the most convincing embodiment of the loss of self caused by the attraction of such an aesthetic where the fascination with jewels causes a loss of self. Except that Huysmans elaborated the stony power of jewelry emphatically outside the social sphere. The villa where ‘Des Esseintes’ pursues his ideal of absolute beauty, elaboratedly incrusting precious stones in the skin of a tortoise that dies of the effect, is isolated from the environment of the city. Braga, as I will argue, counters this splendid isolation, while maintaining the aesthetic of small-scale preciousness in his socially anchored aesthetic of the low. In an installation from 2003 Braga used the device of entropy in a different way, yet from the same commitment to the aesthetic of the low. He had asked his friends to give him old white shirts. Of course, the provenance mattered, in a situation where purchasing the required shirts was just as easy. He compressed each shirt, stitched it together and added embroidery to it. Again, the surfaces of the resulting knotty and hard objects were elaborately ornate, decorated with loving hands. The resulting organic forms, 28 in total, were hung together from the ceiling. Hung without visible hooks, they appeared as if growing from the ceiling, not fixed to it. The shapes looked like organs or abstracted bodies. But for the absence of hooks, the fact that they were hanging from the ceiling evoked the suggestion of slaughtered animals hanging in a butchery shop – or in an old-master painting of a butchery shop. In the same space, drawers and glass showcases were installed with neatly folded shirts in them. The materials and procedures, which had result in this installation, are again emphatically coded. Textile and embroidery as well as the performed operations of stitching, embroidering, and folding are seen as feminine. On top of one case, a pillow with an embroidered band brought into display the intimacy of the bedroom. The provenance of the shirts is an indispensable, performative element in this work, for it is through it that the skin, warmth an all, comes into purview. The white shirts on which these different operations had been performed evoke the skin of his friends’ bodies. When worn by the friends, they protected, contained and dressed those bodies. Whereas as a social element of a dress code, a white shirt as such is an anonymous object, the moment we see it in a drawer or in a closet, it becomes an index of its owner. The presence of his body is evoked in the most intimate way, as intimately as the pillowcase had announced, as a footnote or gloss. But now the bodies are no longer present. The negative suggestion of bodily presence is, however , turned inside out in the other part of the installation, the sculptures hanging from the ceiling. There, the white shirts are no longer presented as the ‘second skin’ of a person’s body. They have body themselves now, they are bodies or bodily organs. The shirts no longer function as second skin or boundary; as the social boundary between nakedness and acceptable clothing. Instead, the inside and ouside of that boundary have become one contiguous field. This continuity between inside and outside, social and public and intimately private, doubles up and thus brings to awareness the setting of exhibition itself, where the permeability of the boundary between private and public, and inside and outside, is architecturally and institutionally enacted. When I write ‘bodies or bodily organs’, I am also referring to French philopher Gilles Deleuze, who characterizes the figures in the paintings of Francis Bacon in his book about this painter, ‘The Logic of Sensation’, as ‘bodies without organs’. He understands organs as a kind of centers within the body through and around which all bodily processes are united. From this perspective the boundary of the individual body does not only depend on the container of the skin, but also on organs as functional centers within that skin. When in the case of Bacon’s figures those organs are missing, the implication is that those bodies fall apart, they are no longer bounded. Metaphorically, it indicates a loss of self and a view of the human subject as the opposite of autonomous or individual. Braga does not represent bodies without organs, but, on the contrary, bodies that consist of nothing else than organs. The body has become just an organ. Ultimately, this body image has implications to those of Deleuze’s ‘bodies without organs’. Braga’s ‘organs without body’ no longer refers to the autonomous subject as individual, but to a subject that can only be or exist in intimate connection to the outside or other. The outside world has become the bodily environment for the ‘organ subject’. The always fragile distinctions between self and other, between familiar and strange, inside and outside are no longer held or aggressively defended, but presented as lost. But, in tension with the views of skin cited at the beginning of this essay, this loss is not mournful, unhealthy, or desperately countered. More positively, these precarious and ultimately untenable distinctions are here presented as no longer desirable. Again, what is at issue is the question of boundary. Surface and boundary in dialogue appears to be the primary preoccupation of Braga’s work. This issue recives yet other ramifications in a series of works on paper, which Braga started to make in 2004, qualified as ‘drawings’. These drawings are, however, not made as drawings tend to be, by means of a pencil that leaves contrasting lines on the paper that serves as ground. Braga gives the concept of line a new philosophically intense meaning. The drawings are made by a knife that makes small cuts in the paper. The resulting shapes (of organs) don’t have the contrasting contours pencils traces would leave. The drawings are either completely white, or completely black. As a result, the distinctions between figure and ground is undermined. There is no longer a reassuring sense of hierarchy that makes forms readable as representations. The simple replacement of pencil with knife enacts a radical modification of how our culture conceives of art, more generally, signs. When the boundary condition between figure and ground breaks down, representation ends up in a situation where distinction becomes difficult. This condition can be understood as a form of mimicry. This phenomenon has been described in a very famous essay by the French thinker Roger Caillois, titled ‘Mimicry and Legendary Psychastenia’. One speaks of mimicry when organisms adopt the visual looks of their surroundings so that there is no longer a clear-cut distinction between the organisms and its surroundings. This idea was widely discussed in the surrealist movement, to which Caillois was related. This unimaginable continuum is the basis of Braga’s re-conceptualization of drawing. In Braga’s white and black drawings the figure-ground distinction is no longer at work. The cuts form a distinct shape, not on, but in the paper, but the shape is part of the continuum in which it has come about. This continuum is not only produced by the lack of color distinction but also by the procedures performed on the paper. The sheet of paper is in the most literal way neither the ground nor the surface onto which the drawing is added, or applied. The sheet of paper is a site, the place of action of a time-consuming activity that connects top and bottom of the sheet of paper. Thus, paradoxically, cutting becomes a form of connecting. Including, as will become apparent later, the association with blood, danger, and pain. The organ-like shapes that are the result of this connecting activity intensify the connotations which were already produced by this activity. The question of boundary is not only put forward by the motif of the organs-without body but also by the refusal of the figure-ground relationship that produces boundaries as contour. The organs are even deprived of their own precarious delimitations. In light of this, it might be a bit surprising that these drawings are, properly speaking, beautiful. Beauty, here, is not an adaptation to traditional aesthetic value, but the forceful intimation of an affectively-informed idea. The sheer beauty of the white and black drawings indicates that Braga’s ‘depersonalization by assimilation of space’ is not a negative condition. A photograph from 2005 conveys this positive notion of depersonalization, or perhaps better, de-individualization, in yet other ways. The photograph is again a close up of human skin. A text has been written on the skin/photography by means of perforation. It must be noted, however, that the text is not inscribed onto the skin. It bursts out of the skin. The perforations are not penetrations of the skin. They have been performed from bottom to top of the photograph, from inside to outside of the skin. This pantheistic text can be seen as programmatic for Braga’s work. Anthony feels, in the words of Caillois, himself becoming space. He wants to assume all forms, he does not want to be similar to something, but just similar. Ultimately, the quotation articulates the absolute negation of boundaries and distinctions, and offers a notion of subjectivity that is not based on differentiation but on intimate connectedness. The transgressed boundaries in Braga’s work that I have discussed so far, concern the distinctions between self and other, between inside and outside, between form and content, between figure and ground, and between sight and other senses. One more important distinction should be added to this list, and this is the one that connects Braga’s work, after all, to Barthes’ and Acconci’s musings on photography: the absolute boundary between life and death. It is also the boundary that positions Braga’s work socially and historically, and that provides an interpretive context for the positivity of his vision. This boundary was emphatically at issue in his 2004 three-part installation in Bureau Amsterdam, the contemporary art space of the Stedelijk Museum in Amsterdam. The title of this installation was ‘Full Blown’. This ambiguous expression refers first of all to flowers in full bloom. But at the same time it refers to the moment at which a fatal disease such as cancer or AIDS emerges in its strongest or most developed form. Part of the installation consisted of a floor work of a field of countless pale wax flowers. Their combined weight was 65 kilos, equaling the weight of the artist himself. The installation evoked the floor fields of candies by Feliz Gonzales-Torres and the minimalist floor sculptures of Carl Andre. Each flower had been cut out and shaped from wax plates that Braga had molded and hardened himself. During this time consuming process their hues had transformed from translucent to opaque. As Marjan Boot remarks in her essay on Braga’s work, was has a rich iconography in relation to the body, sickness and death. Well-known uses of it include death masks. The plasticity of wax also made it into an ideal material from which naturalistic anatomical models were made. And in Christianity the most vivid expression of the link between wax and the human body was in naturalistic votive images of afflicted parts of the body, presented in supplication, or gratitude, for a cure. Symbolically, wax refers to the sacrificed body of Christ. Originally made by chaste bees, wax was regarded as pure material. From that perspective, it became an allusion to the purity and chastity of Christ. The installation ‘Full Blown’ conforms to the iconography of death in several other respects as well. The choice of material, the motif of flowers (traditionally put on fresh graves of the recently deceased), and the installation’s form (of the shroud) all refer to death. The title, however, complicates this. Its ambiguity seems to be an allusion to a more specific iconography, namely the one of entropy-after-AIDS. The negative moment of entropy, its presupposition of an initial order and the deterioration of that order, has received specific ramifications, in times of AIDS, in relation to the realm of life and death. It is Caillois’ essay on mimicry that illuminates this interpretation. The mimicry of the praying mantis is not restricted to the visual mimicry by which the mantis is indistinguishable from its leafy milieu. In addition to its mimetic looks, the praying mantis uses the strategy of ‘playing dead’, by folding itself into immobility through which it becomes completely indistinguishable from the branches on which its sits. So deep is the imitative reflex ingrained in this creature that, when decapitated and thus really dead, it can continue to mime the function of life all the way up to the ultimate form of its preservation of life, in ‘playing dead.’ The mimicry of the praying mantis makes it possible to imagine the impossible statement of ‘I am dead’ to be projected within the condition of life. This contradictory and thus impossible statement has become, however, the most acute characterization of people with fatal diseases of which AIDS has become symbolic. Suddenly, the absolute boundary between life and death no longer holds. Death is folded into life, while one is still alive. The expression ‘full blown’, is the ultimate and most unsettling manifestation of entropy. Braga’s entropy-after-AIDS imaginary retrospectively illuminates aspects of all the works discussed so far. The elaborately embroidered and bejeweled fist-size organ shapes push their blood-red or deadly white colors into the face of those now alerted to this association. The skin cut through to make shapes is now over-determined with the permeability of skin as the site where AIDS is shared. Anthony’s jubilant merging with space also announces the disappearance of humans when dust returns to dust. This imagery is further elaborated in a series of photographs of porcelain flowers. The flowers represented are of the kind that are put on graves in France and Italy. Braga acts upon these photographs. With a knife he penetrates them or perforates them from below. Curly cuttings are made, or with blood-red ecoline little dots are added. The result of these interventions visualizes processes of growth, of contamination of uncontrollable proliferation. While deploying figurations of ornate beauty, the flowers become organs or tumors. In some cases Braga’s has re-photographed the worked- upon-images and subsequently continues acting upon the resulting image. This results in a dazzling entanglement of layers, surfaces, and gestures that connects, forms and deforms them. The separate surfaces cannot be recognized as distinct anymore. They are no longer boundaries. These photographs propose an imaginary of the skin as, literally, ‘full blown.’ This is done even more literally in some photographs of close-ups of skin into which curly cuttings have shaped the forms of flowers. The cuts contrast with the skin because red pigment has been left in them. The fine, thin lines of the flowers are related to the skin of the photograph with which I began this essay. The permeable skin flowers and bleeds are at the same time, beautifully uncanny. Entropy-after-AIDS implies a specification and exploration of entropy in the realm of time and mortality. The hair-flowers bring this literally close to home, for a myopic, detailed view that imposes proximity, a willingness to come close, close to the touch. Braga has put this issue up front in the Expiration Date series of 2003. Here, however, no flowers bring homage to the dead nor evoke the regeneration of nature. This time, on sheets of virginal white paper he has perforated the expiration dates as can be found on medication. Again, no figure, no ground. The series consists out of 14 ‘drawings’, the number referring to the stations of the cross. The process of perforation immediately evokes the idea of skin, and hence, the expiration dates become ambiguous. It no longer applies to medication only, but also to skin. Hence, with a seemingly naïve literalism that underlines his other visual puns, the work asks: when is our expiration date? As I have already pointed out for the other works where perforation is the medium, again the perforations have been performed from bottom to top of the paper sheet, unfixing the surface from underneath, or from within. As a result the expiration dates do not derive their visibility from being inscriptions on a sheet or penetrations of the skin, or both at the same time. They burst out of the skinsheet. This technique stipulates that mortality hides within the body and is not something which is introduced into it from the outside. But at the same time, our skin was never a boundary that protects the body, for the mortal body cannot be protected. Yet, the visual effect of bursting out also evokes the flowering of flowers, the buds that burst out into full blown flowers. Through this allusion, the works respond and deepen each other. Permeability of skin, bodies merging into space, visibility turned inside out: these theoretical motives suggests a context for Braga’s work that I find particularly strongly represented in the perforations. That context is baroque, not in the (art-)historical sense but in a contemporary theoretical or philosophical sense. As is well known, light, its manipulation and unexpected effects, illuminating as well as obscuring, is a primary tool of baroque aesthetics. Braga’s perforations produce a slight relief on top of the paper. As with the precious stones of glass beads popping up on the red organs of ‘Rubros’ and the white organs of ‘Brancos’, this un-making of surface smoothness has subtle consequences for the distribution of light on the image. Light is no longer concentrated or harmoniously distributed. Instead, there is a kind of luminous dispersal. Krauss calls this kind of dispersal of light ‘wild light’ or ‘gleams’. This wild light is also intensely produced by the cuttings in the photographs, and by the beads in the ‘Rubros’ and ‘Brancos’ series. Some cuttings reflects the light, others do not. The multi-facettedness of beads multiplies this principle to the extreme. From this perspective it is not surprising that for psychoanalyst Jacques Lacan the resulting scattered light can most emblematically be found in the jewel. As an irradiant object, the cut precious stone such as diamonds that constitute the jewel produces light in all directions. This utterly baroque principle makes it impossible to make a clear distinction between source of light and illuminated object. In line with the idea of permeable skin, this wild light has its repercussions for subjectivity. The wild light a produced by jewels can take the form of abrupt highlights on bits of flesh or of the fabric of the pieces of clothing to which it is attached. Certain spots pop out of a larger context that as such remains undifferentiated . Wild light does not produce the subject as lighted, focused center, but as dispersed, or a la Lacan, as ‘stain.’ A stain, whose boundaries are not absolute, not ‘neat’ and clear but diffuse, blurred, and unstable. Only as such, a changing and moving (in the double sense of the word) stain can the subject be. This wild iridescence of light is, indeed, a feature of baroque aesthetics. As such, it does not stand alone in Braga’s art. Many other baroque devices can be recognized in his work. The tension between micro-and macroscopic, between two-and three-dimensionality, between absorption and reflection, belong to the central repertoire of baroque aesthetics motives. On the condition, however, that baroque is no longer seen as specific historical style. In the case of Braga as with many contemporary artists, it is more than just that. He uses these baroque principles as articulations of his political and philosophical positioning. What these principles say, or do, is stating where he, and we, stand. The other position, the position of the other, the connection to the other, are absorbed into his baroque perspective. For, establishing the possibility, even if fictional and metaphorical, of sharing a common skin is ultimately a baroque pursuit.